Military Moms of Texas is an organization started by a woman from Round Rock, Texas named Tracy. 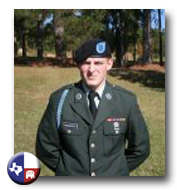 Tracy's son is a member of the U.S. Army and has been recently deployed. Tracy started a local Texas group for military families, friends, and locals to connect, volunteer, and support our troops and their families from right here in Texas. To get involved, you can look on the Military Moms of Texas Facebook site for information on events, care packages, cards, and the many things our troops from Texas are left without. The group also meets on the second Saturday of each month. Follow Military Moms of Texas on Twitter.